Alkaline Trio have posted their contribution to the upcoming Warped Tour compilation. The record is titled Warped Tour 2007 and is due out June 05, 2007. You can check out “Fire Down Below” on their myspace page. The whole “story” is an outdated throwback to the early days of punk, when the mass media vilified that subculture as a kind of alien germ infecting America’s youth. Then, as now, the media missed the self-mocking humor in the music and among the fans. In this new report, several kids explain the dark philosophy of emo in somber tones – they’re clearly struggling to keep a straight face. So cheer up, emo kids. Things could be worse: You could live in Utah. The column can be found here. The Legendary Shack Shakers have announced a summer tour beginning June 7th at The Mad Hatter in Covington, Ky. The Mad Hatter has recently hosted legendary acts such as Jello Biafra, The Queers and The Casualties, as well as The Lawrence Arms. The band is inspired by punk, polka, delta blues, hillbilly, and other traditional Southern music genres, formed in Nashville, Tennessee in the mid 1990’s. The band originally had a more traditional rockabilly sound, but later moved away from this and now relies more on its punk and hillbilly influences. Former Fueled By Ramen act Days Away has posted a new track online. You can check out the new song “Wish” on MySpace. In April, The Measure [SA] released their new full length, Historical Fiction. The record has earned comparisons to Discount, The Pogues, American Steel, and The Ergs. We’ve got the entire album for you to check out and you can find it on their Punknews.org Profile. Nominees and performers for MuchMusic’s 2007 music awards have been announced. The 18th annual awards ceremony will be held in Toronto, Ontario and the nominations are led by Billy Talent and Nickelback with five nods each. Rappers Belly and k-os are also tied with four nominations. Alexisonfire, George, Avril Lavinge and Nelly Furtado round out the other Canadians up for multiple awards. International artists up for an MMVA include Akon, Justin Timberlake, Hilary Duff, Fergie and My Chemical Romance. The event will also feature live performances from Billy Talent, Alexisonfire, the Used, Avril Lavigne, Maroon 5, Belly, Fergie, Finger Eleven and Hilary Duff. The annual event is held by MuchMusic, a music television network covering most of Canada. The Quebec equivalent, MusiquePlus recently announced sponsorship of the Fat Wreck Chords Canadian tour. End of an Era… Beginning of an Another It is with the utmost respect and appreciation that we are announcing that Cougars is parting ways with it’s mighty horn section (Jeff Vidmont and Mark Beening) after 6.5 years of loyal rockitude. This decision was not arrived at easily or flippantly. Great consideration has been given over the last year, as we begin a new writing process for what will prove to be our most crucial work yet that issues had to be addressed and the process, ultimately, had to be streamlined. All in all, we appreciate everything Mark and Jeff brought to the table over the years and sincerely wish them the best in every future endeavor. Meanwhile, never fret, as Cougars does not cease to be. Through this subtraction, it grows. Tighter, stronger, and even more pissy, plans to kill you thoroughly are in the works as we speak. The band’s previous album, Pillow Talk, was released in 2006. Since then they also produced a contribution to the Hair: Chicago Punk Cuts compilation. A reader has let us know about an amateur recording he put together of Good Riddance‘s final show. As reported earlier, the performance was recorded for an upcoming posthumous live release. The band apparently allowed fans to videotape the show and the performance can be found, broken up by song, right here. Volcom has announced plans for a label-themed summer tour to be headlined by two bands on the label. The 2007 Volcom Tour will feature Riverboat Gamblers and Valient Thorr and feature support from labelmates Totimoshi, Birds of Avalon, ASG, and Year Long Disaster. The tour will be hitting over 40 cities across the nation beginning August 1, 2007. Confirmed venues and cities will be announced shortly. Both headliners are supporting recent releases. Valient Thorr is touring on Legend of the World and The Gamblers are supporting To the Confusion of Our Enemies. Lindberg, 41, is one of the aging breed of punk rockers from the 1970s and 1980s who are finding a way to reconcile a life of rebellion with parental responsibilities such as disciplining children and worrying about media violence. Like the 2006 edition, the Warped Tour has opened up voting to allow one band on the main stage to perform for an extra ten minutes at different stops. You can vote for one of the headlining bands right here. Pig Destroyer have posted a new e-card/player for their upcoming album. The record is titled Phantom Limb and is due out June 12, 2007. They recorded at Omega Studios (Bad Brains) in Rockville, MD under the helm of guitarist/producer Scott Hull. 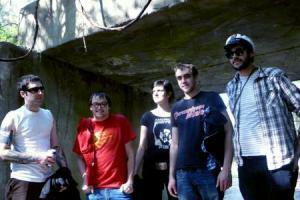 The band’s previous album, Terrifyer, was ranked among the best albums of 2004 by Punknews.org. You can check out the e-card here. To The Lions, featuring former members of Confine, Grade and SeventyEightDays in its ranks, has just launched an e-card for their Goodfellow Records debut “Baptism of Fire”. The band promises a sound that harkens back to the early nineties heyday of bands such as Unbroken, Chokehold and Undertow. You can stream the entire full length here.